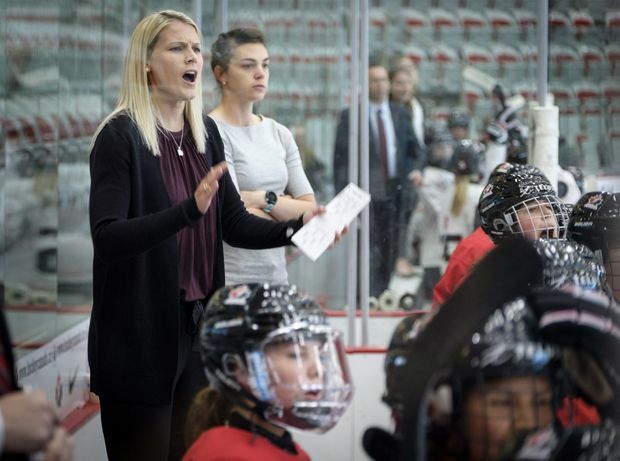 Courtney Kessel, a former player on the Canadian women's hockey team and now an assistant coach of Canada's under-18 team, coaches an inter-squad game in Calgary on Aug. 8, 2018. When Courtney Kessel was named head coach of the Toronto Furies, general manager Sami Jo Small says she received Twitter messages asking her why she hired Phil Kessel’s sister. So, to clarify, Courtney Kessel is the sister-in-law of the NHL player and former Toronto Maple Leaf, and not sister Amanda, who plays for the U.S. women’s national team. Courtney Birchard may have married into U.S. hockey royalty when she and Blake Kessel wed last year, but she has her own hockey pedigree. The defender from Toronto played in three women’s world championships for Canada – twice against Amanda – and won gold in 2012. She still has playing years in her at 29, but unexpected opportunities aligned this year with coaching ambitions she’d long harboured. “When I was playing and on the bench, I’d be thinking in my head about coaching techniques,” Kessel told The Canadian Press. Hockey Canada has brought her into its coaching ranks. Kessel was in Calgary this week as an assistant coach for the national under-18 women’s team. She was a last-minute replacement in January for an assistant who stepped down from the development team staff for the Nations Cup in Germany. “It added to her résumé,” Small said. “I wanted her as part of the staff. Small wanted a support system around Kessel, so Ken Dufton, a veteran coach in the women’s leagues and a former national team coach, is Kessel’s adviser. The six-team CWHL pays coaches a stipend, but not a living wage the way an NCAA or Canadian university coaching job can. Now that she’s hired Kessel, Small hopes she can retain her.